March 17th has been observed as the saint’s religious feast-day for more than 1,000 years! Be a wee bit Irish this St. Patrick’s Day, but go beyond simply wearing green and giving a pinch to those who don’t. Celebrate the rich Irish culture, history, and customs with a few of our festive recipes. One of our favorite things to do at Wisconsin Dairyland Fudge is come up with unique and different treats for holiday gift giving and we’ve done it again for St. Paddy’s Day. Our kitchen has been full of the aromas of chocolate, mint, cinnamon, and vanilla as we’ve been busy cooking up treats to celebrate this year. Since fudge is our specialty and what started it all here at Wisconsin Dairyland Fudge, we’ve concocted a “magically delicious” Luck of the Irish Fudge to spread the holiday spirit! Irish “Potatoes”, a century old tradition, are the perfect treat for a St. Paddy’s Day party. These yummy confections start off with a fresh coconut butter cream center which are hand formed into cute potato shapes and dusted in cinnamon. Speaking of traditions, did you know corned been wasn’t even associated with the saint’s feast-day until the turn of the century? According to history.com, Irish immigrants substituted corned beef for their traditional meal of boiled bacon to save money. Cabbage is not the only thing bacon makes taste better. The sweetness of our signature chocolate blend and caramel corn recipes is a perfect match for the smoked bacon’s saltiness. As luck would have it Chocolate Dipped Bacon and Bacon Caramel Corn will also go great with your favorite green beer. Maybe you crave salty and sweet, but desire a creamy treat that will melt in your mouth, with a touch of beer. Beer Infused Caramels are made with a locally brewed ale for just the right balance between sweet and malty. Indulging in chocolate is often referred to as a guilty pleasure, but Valentine’s Day is one exception to splurge. As it’s been often said, the way to someone’s heart is through his or her stomach. Whether you’re treating your sweetie to a romantic dinner at a fancy restaurant or planning to cook a delicious meal in the comfort of your own home, complement these gestures with something sinfully sweet – because no Valentine’s Day is complete without a little chocolate. For that special someone who makes your heart flutter, we have designed a creamy milk chocolate Valentine Fudge and heart-shaped fudge dipped in sweet milk chocolate and embellished with mini hearts. Or treat your Valentine to Chocolate Dipped Fudge Bites. Of course, the best Smooch of all comes in chocolate. To take an appetizing look at all of our Valentine products, CLICK HERE to peruse our site. We’re sure to have something that will warm the heart and satisfy the sweet tooth of your Valentine. What is your favorite candy to eat on Valentine’s Day? Let us know in the comments below! Baby, it’s cold outside! The good news is, we have the perfect hot chocolate varieties and recipes to warm you right up! No longer will you fear cold weather reports and future snowstorms. In fact, you’ll hope for bad weather, just so you have an excuse to try all three of these. 1. Hot Chocolate on a Stick is carefully handcrafted of our finest couverture chocolate (premium chocolate that contains extra cocoa butter for incredible creaminess) which is combined with cream and mixed into a decadent mass of chocolatey bliss. Once it cools it is cut into squares and combined with a cube of our homemade special recipe marshmallow. Simply swirl the blocks into steaming milk, and you’ll have a cup of hot chocolate worth lingering over while our homemade marshmallow slowly melts to form a rich frothy topping. Or you can even eat them as is right off the stick to satisfy that craving for something sweet. 2. Salted Caramel Drinking Chocolate is a combination of caramel and chocolatey goodness with a hint of sea salt. Just add your warm milk of choice. 3. 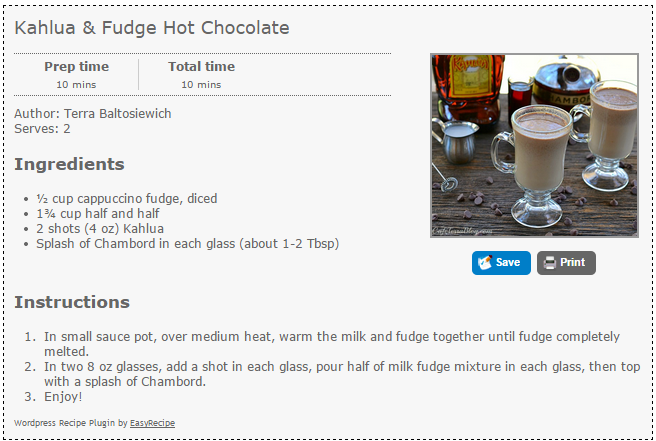 If you prefer something a bit more potent, Cafe Terra’s Kahlua & Fudge Hot Chocolate Recipe will warm you right up! What’s your favorite winter warm-up: coffee, tea, or hot chocolate? Or do you prefer something a bit more potent? Let us know in the comments! Whether you’re looking to surprise mom with something heartfelt, give dad a gift to show your appreciation, find something fun for your siblings or show your significant other how much you care, we have homemade gifts for all of the hard-to-please people on your list. Not sure what to buy for everyone? Don’t worry! 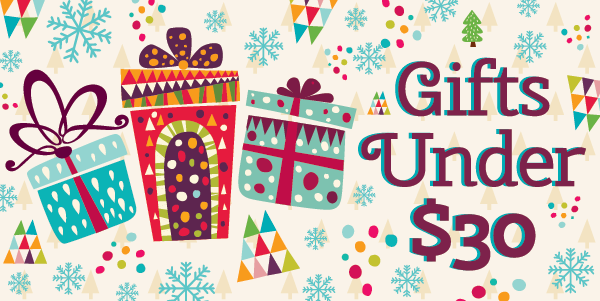 We’ve made it easy this year by giving you our own list of top holiday gifts. Caramel Box – A little box with lots of chew. Chocolate Fudge Snowflakes – You and your gift recipient will love to eat these snowflakes! Business Card Fudge Box – Keep your customers smiling. Peppermint Stick Bark – A velvety-smooth base of peppermint infused dark or milk chocolate (your choice) topped off with a layer of white chocolate and a dusting of peppermint pieces. Red Sprinkle Caramel Apple – A sweet and tart Granny Smith Apple bathed in our homemade caramel and dunked into our blend of creamy white chocolate with a dusting of red sprinkles. Perfect for the holidays! Hot Chocolate on a Stick – Great stocking stuffers and gifts for teachers! Swirl the blocks into steaming milk, and you’ll have a cup of hot chocolate worth lingering over while our homemade marshmallow slowly melts to form a rich topping. Pick Your Passion Set – These bite-sized boxes of our signature chocolates and fudge are perfect for anyone on a limited budget. Peppermint Truffles – Our candy crafters hand roll and hand dip each truffle. Packaged 8 per gift box. Chocolate Truffle Bowl – A totally edible gift… bowl and all! Gold Gift Box – An elegant thank you. Holiday Candy Bar Set – This attractively holiday set of our homemade candy bars includes: dark chocolate mint with peppermint stick topping, solid milk chocolate, milk chocolate with gingerbread pieces and white chocolate drizzle, white chocolate mint with peppermint stick topping, and milk chocolate with cranberries and drizzled with white chocolate. Giant Chocolate Bon Bon – A very unique gift that is the perfect alternative to a traditional cake! Fill the hand molded hollow chocolate shell with your own trinkets, or we can fill it with delicious treats for you. Mallet included for smashing. Assorted Chocolate Gift Box – 18 pieces of our most popular hand-dipped chocolates, attractively packaged. Great for passing around the office or a party. Assorted Gift Basket – This will satisfy everyone on your gift list. Tower of Temptation – Turtles, Fudge, and Cashew Crunch. Almond, Cashew, Peanut, and Pecan Brittle Gift Tins – For the non-chocolate lovers on your list. A Pavlova not only sounds lovely, it looks gorgeous too. Okay, you might be asking, what is a Pavlova? It is a light and airy meringue-based dessert. Each bite just melts in your mouth. A fun fact: It was named after the Russian ballet dancer Anna Pavlova. The lovely dessert can be vanilla, chocolate, mint, you pick the flavor. To top the dessert off, add berries, whipped cream, or something that screams Fall. 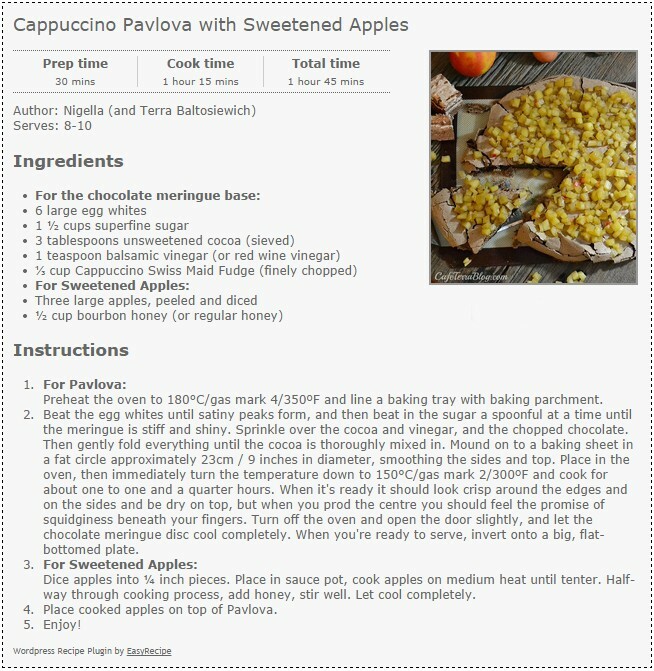 For now, let’s enjoy some Cappuccino Pavlova with Sweetened Apples. It will puff up while baking, then deflate while cooling. The outside is a delicate shell. The inside is soft and fluffy. I love this time of year, everything I make seems to include apples. So it seemed fitting to combine apples with chocolate. The flavors worked perfectly together! I have had a Pavlova on my Kitchen Bucket List FOREVER. When I received some delicious fudge from Swiss Maid Fudge, I decided it was time to finally make this delicious dessert. It really is not hard to make, and does not require very many ingredients. Adding some Swiss Maid Fudge will add little pieces of happiness with each bite. Since I have never made this dessert before, I found the perfect recipe on Nigella Lawson’s site. She made the recipe easy to follow. Now I plan to make this recipe a lot in the future. It would be perfect as a birthday cake, yum!! via Cappuccino Pavlova with Sweetened Apples. The Fall Wine Walk will be held Friday, September 26 from 4-9 pm. Tickets are $25 in advance and $30 the day of the event. With the purchase of a ticket, participants receive a commemorative wine glass to use for the event and a punch card/map to use as a guide for participating businesses. Over 20 Downtown Dells businesses will be participating, allowing attendees to easily explore and enjoy all that Downtown Dells has to offer. Any profits made from the event will go to benefit the Knights of Columbus Wisconsin Dells Chapter. The Knights of Columbus support charitable events and causes around the area. Wollersheim Prairie Fume is a crisp semi-dry white wine bursting with citrus and tropical fruit aromas reminiscent of orange and grapefruit with a hint of sweetness. Anakena Carmenere is deep red in color. This wine is made in a ripe style of Carmenere, with a nose that offers aromas of red and black fruits, dark chocolate, and Black Forest Cake, along with spices such as cloves and black pepper. The elegant palate features good integration of fruit and oak from the barrels. The palate is juicy, and the wine has tannins with great acidity leading to a long finish. We will also be serving hors d’oeuvres to pair with these wines including Chocolate Dipped Grapes. This year we will be dipping a variety called Witches Fingers, an elongated purple grape perfect for the fall! We will be having a drawing for a chance to win a wine and champagne glass filled with mouthwatering chocolates ($30 value). To enter, participants simply have to “Like” our facebook page. That’s it! If you already follow us, “Share” this blog on your facebook page and then leave a comment below letting us know you did so to be entered. 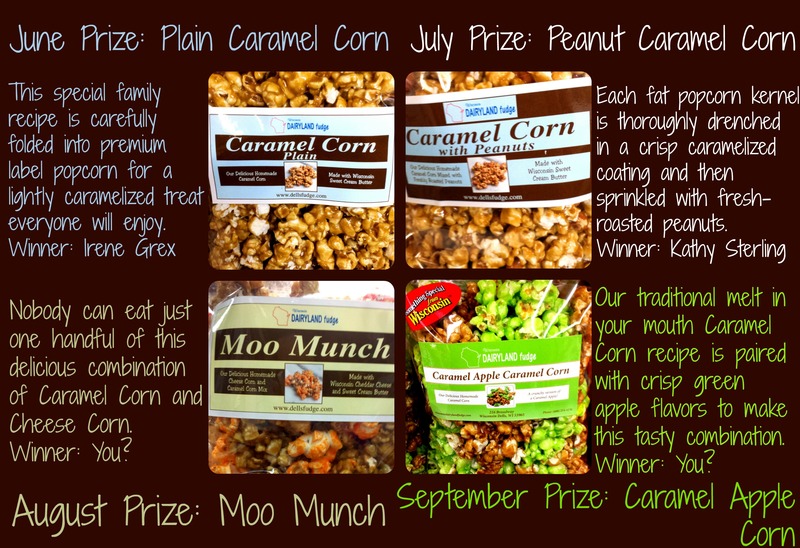 The winner will be announced via facebook on Wednesday, October 1.